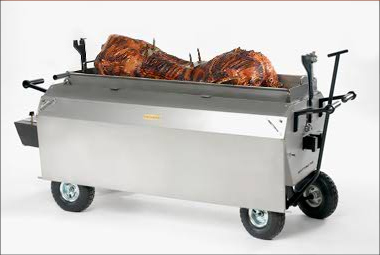 50kg hog will feed 65-70 plated or 80-120 in rolls. The spit hire, gas, chef , gazebo, disposable plates, napkins, apple sauce , Rolls or French bread. Delivery and collection can all be arranged. We can also supply Marquees, Tables and Chairs, Buffet, licensed bar and disco if required, Please contact 07950781277 for further details. Extra joints of pork, lamb or beef can be provided as you require with additional buffet. All Marquees,tables, chairs, carpets, Licensed bar and Disco also available to make your celebration that extra special.